As an added bonus, this home is within walking distance of Pace Academy. Interior Features This home features giant vaulted ceilings highlighted by custom sky lighting. Every room in this home has fantastic natural light and is accented with a muted color pallet. It’s gorgeous wide-open spaces and oversized rooms are ideal for living & entertaining. Special attention to detail is evident in the high-end gourmet kitchen which has granite countertops & breakfast bar, custom island & top-of-the-line appliances. The high ceilings & natural light are carried through the exceptionally elegant master suite. The special attention to detail is evident by architecturally mirroring the stunning window design throughout the master bathroom. You’ll enjoy relaxing in the spacious shower and large jetted tub. 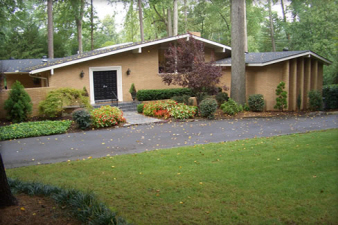 Exterior Features This home is situated on a full acre lot with spectacular trees, pool & lush lawn. There are three magnificent outdoor entertaining areas with professional landscaping throughout. Additional Features and Amenities The full basement includes a recreation room, large fifth bedroom & full bath in addition to a large, dry storage area. The massive recreation room includes a bar with built-in refrigerator and opens out to the pool area. As an added bonus, the swimming pool has direct access to the full bath.